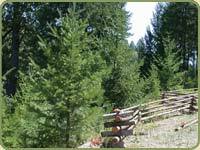 Overgrown suppressed stands of Douglas fir are logged for better forest environmental health. Trees that should be spaced 30 feet apart are typically targeted ( as seen with blue paint markings). 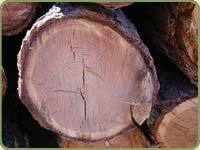 Growth rings show the wood is particularly dense. This product is excellent for a variety of uses from rail fencing (using small diameter logs) to posts and poles for construction. Whole trees are available for sale. Left: Unpeeled logs rest ready to be shipped to the mill. Bear Creek Lumber selectively harvests posts and poles in diameters of all sizes and lengths from its forestry operation. The trees are hand marked, cut and peeled. Shown in the pictures below are peeled 10 inch posts and unpeeled 3-4 inch rails. The rails can be used as natural fencing or for furniture. The natural character of some of the rails makes for interesting natural shapes. The property has mistletoe which can be a huge fire hazard. As part of the company’s restorative thinning, many mistoed trees are being harvested including some larger 12-18 inch trees. For more information about these fir products, call 800-597-7191. Logs will be available until snow closes the roads in late October/early November. The newest, and most dynamic aspect of North American forestry is the attention now being given to sustainable forestry. In essence, sustainable forestry is the pursuit of innovation, investment, and institutional reform for regimes of actions that improve long-term ecological processes, and productivity, while satisfying human wants. Its achievement requires integration of social, economic, and ecological factors to ensure the sustaining of long-term productivity for future generations while producing desired outputs. Rigth: Rail fencing made of small diameter logs. The practice of sustainable forest management requires the contemplated actions be analyzed at the landscape level, and not the stand level, as is common in traditional forest management. Furthermore, all forest resources are recognized and given consideration in the integrity rank on par with economic efficiency, community development, and resource extraction rates. These goals have been adopted, in the recent past, by foresters throughout the world. Forest certification, a voluntary program whereby a forest owner requests a forest inspection to determine if predefined management standards are being achieved, is an increasingly common way for this to occur. Some owners go so far as to request that by passing these standards, they can have their products eco-labeled to signify their products come from such regulated lands that are both sustainably managed, and environmentally acceptable. Left: Four inch dense groth rings. Products that are so managed, harvested, and sold under these labels enter a process called chain of custody, which is a process of monitoring the products to ensure the customer they are receiving the true certified material. The process is relatively expensive, which requires the producer and others who handle the product down the line to sell their product at a higher rate to recover the costs of certification. Throughout the industry, certification is becoming more accepted as a means to assure the public that forestry can be a responsible endeavor. Bear Creek Lumber can obtain practically any type of forest product a buyer may be interested in, including hardwoods, dimensional and finish products such as siding and flooring. Builders, or architects who specify, are looking for sustainably grown lumber products have more choices than ever here at Bear Creek Lumber. The worldwide movement toward certified forestry has offered many new opportunities in everything from floorings to sidings to timbers. Shown to the left is a photo of sustainably grown balau timber. For more information about this and other certified products, call (800) 597-7191. 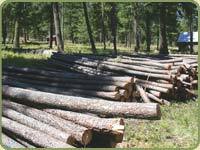 - Ensures timber harvest is ecologically sound, socially and economically beneficial to local communities. - Creates market incentives for producers to responsibly manage forests and harvest timber. - Gives consumers the power to positively “vote” for conservation when they buy wood products. - Contributes to the preservation of forests and forest wildlife worldwide.